haha love your title! cool layout! I have never been to Disney, but I always thought the characters just wondered around the park and you were lucky if you got a photo with them. LOL!!! LOVE IT!!! That title ROCKS!!! I loveeeeeee that photo and love love love love all the journal stickers all over the lo!! You always inspire and amaze me with how you do that!!! GORGEOUS!!!! ABsolutely adorable and fun page. I remember roaming characters as well. Love the photo! Was worth the wait. FABULOUS page and such a cute and creative title! I love it! Very, very cute! Thanks for sharing it! Love it! Great title too. I'm always at a loss and you've thought of a great one! I do remember that and didn't think about it last time we were at Disney. I do know we didn't stand in any lines to see any characters except Mickey though. 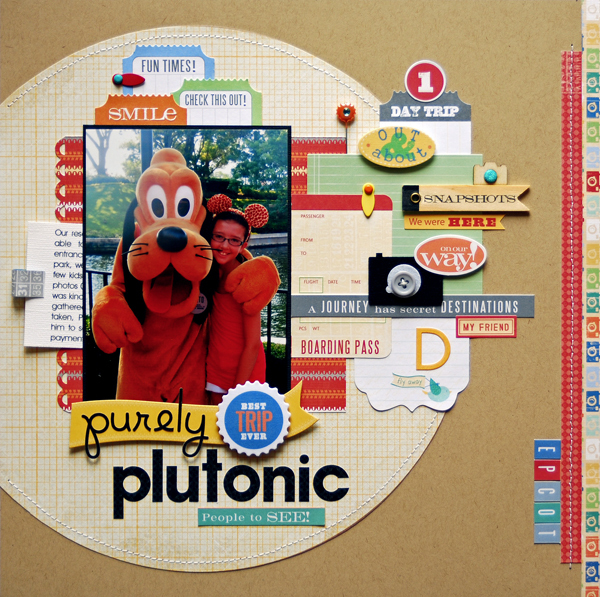 I love how you designed your layout so most of it is placed on the circle with the border strips to balance it out! I love this so much, Lisa! All the bits and pieces are just perfect! ok so I love this and this is probably my favorite "disney" page I have seen. Love all the embellishments... Thanks for sharing. Love this-that title is so awesome. I have to agree with the previous commenter-one of the best Disney layouts I've seen. Oh, how stinkin' cute!!!!! Love it!